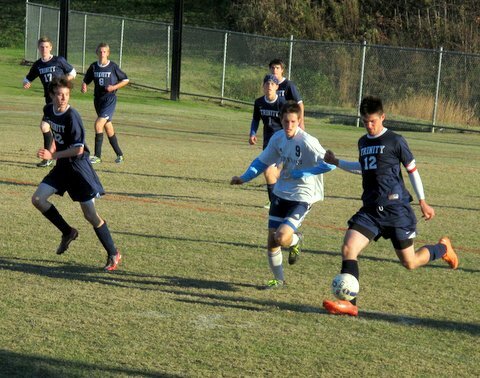 Trinity cocaptain Ben Mysliwiec gains control of the ball. Photo: Lydia Eng. 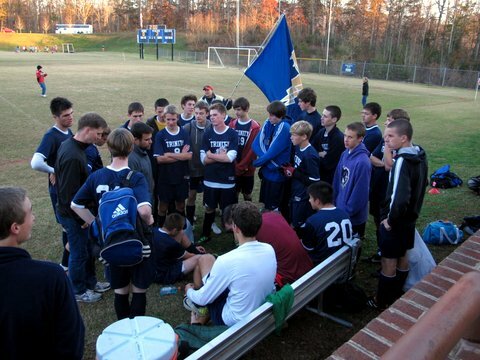 The boys’ varsity soccer team from Trinity at Meadow View made a surprising run through their state soccer tournament. The Trinity team knocked off two high-ranking teams before losing 1-0 in the semifinal game to North Cross High School, one of the top teams in the country. With an 8-6-1 regular season record, Trinity did not expect to make the tournament in the first place. But organizers offered Trinity the final spot in the Division II tournament for independent schools, seeding them 12th out of 12 teams. “The tough schedule we played during the regular season must have caught their eye,” says Meadow View athletic director Rick Schoof. In the first round, they faced Denbigh Baptist, the #5 seed. 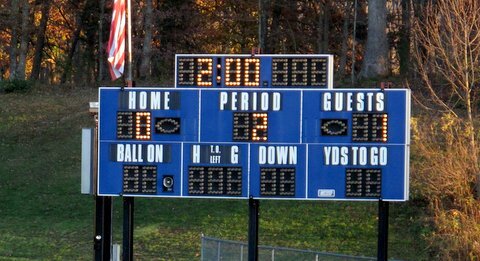 The game was a tactical defensive struggle, with neither team scoring by the end of regulation play. Just seconds after the start of the second overtime, cocaptain Ben Mysliwiec stole the ball, dribbled it toward Denbigh’s goal and took a shot that ricocheted off the post and into the net, ending the game. Final score: 1-0. In round two, they faced #4 seed, The Covenant School. “We knew they were well-organized and would make us pay for any mistake we made,” Coach Will Taylor said. After another defensive battle, Trinity’s Santiago Ruiz scored on a counterattack, chipping the ball over the goalie’s head with 11 minutes left to play. Final score: 1-0. North Cross High School, Trinity’s opponent in the semifinal game, was ranked 13th among all US high school soccer teams. North Cross fielded veteran players from Germany, Spain and Zimbabwe--three of whom played on the Zimbabwean under-18 national team. “They were more skilled than us by far,” Ben said. The Trinity team gathers at halftime. In the first half, North Cross controlled the style and pace of the game, but Trinity also showed some heroics. While making a save, Trinity goalkeeper P.J. Hasson dislocated his elbow, but he popped it back in place and finished the game in pain. About five minutes before the half ended, North Cross scored on a high shot to take the lead. At halftime, Coach Taylor urged the team to put more pressure on the North Cross players and become more aggressive offensively. The team took his advice and generated several chances to score on counterattacks in the second half. “Finally, with three and a half minutes remaining in the game, we had our best chance to tie the game,” says Coach Taylor. Trinity kicked the ball into the North Cross goal box. Cocaptain Brad Elliott found an alley through the tangle of players and took a shot, which went just wide of the goal. The game ended with North Cross ahead, 1-0. Around 70 students, parents and faculty drove two hours and braved the chilly temperatures to support the Trinity team. “They just would not give up! They pushed hard, played smart and looked out for one another,” said parent Maria Elliot. “It was a fantastic moment that I’ll remember for a long time,” added defensive player Andre Magill. Way to go Tempest! Congratulations to each of you and to Coach Taylor. So proud of you all! We were cheering for you all the way from Hawaii. Great job and you should be proud of your efforts. Wonderful news, and great reporting. I counted stop until I made to the end of the story. Congrats to Meadow View. What a great witness to the character of all the players on the Meadow View team! Congratulations! Congratulations to all of you for so many amazing wins! One more detail: Didn't North Cross not only win the championship of the league, but also have a 25-0 season? What a great story! Congratulations to all the team on a job well done! "...it's how you play the game..."
Super.... We could feel your excitement and well deserved pride. Congrats to everybody on the team AND to those who braved the cold and cheered the guys on. Thanks for the tect updates too. Another story to be added to the Trinity story. A real "David and Goliath" story of courage and perseverance. Congratulations, Meadow View, on an awesome soccer effort with incredible results. Your hard work and perseverance shine out into the world. God bless Trinity School at Meadow View!